4. Simultaneous use of up to 5 lasers by switching over the components inside the system. 7. Use of inverted and upright microscopes is possible. 8. Telescope with variable magnification for adapting laser beams to entrance pupils of microobjectives from 3 to 12 mm. 10. High sensitivity at low power of laser excitation (from µW to mW). 11. Reflection module for simultaneous obtaining of 3D image in reflected light. 13. Fully automated control of the system. 14. High temporal and temperature stability is provided by modular rigid and rod design. 15. No fiber optics that decrease some optical parameters (transmission, wave front, polarization). 16. Ring illumination for combination with AFM. The reflection from silicon wafer, obtained by moving the objective lens along the Z axis. FW HW - 442 nm, λ=488 nm, 100x objective lens. 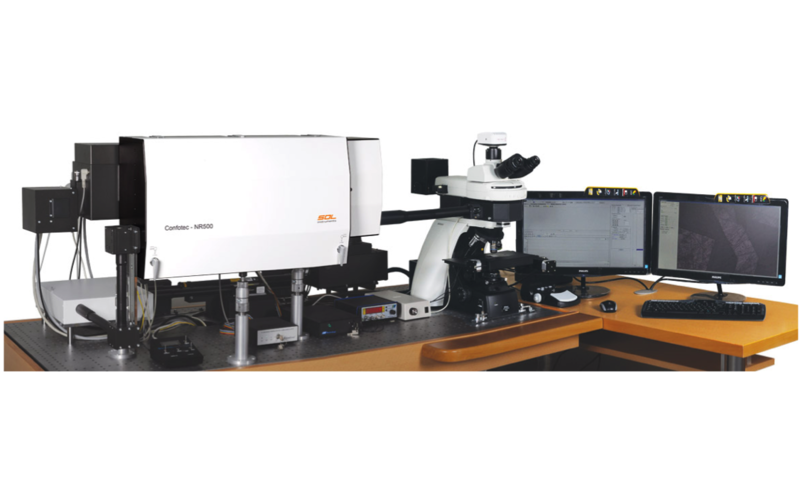 spectral resolution up to 0.006 nm, astigmatism less than 5 µm. Pinhole spectral image at CCD camera. Raman spectrum of Si wafer. Si (4) peak is clearly detected. Si (1) and Si (2) are in deep saturation. Confocal mode. Accumulation time - 60 seconds.